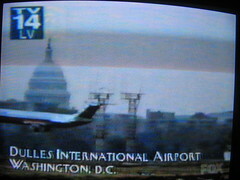 So I tried watching Bones last night, and in the first two minutes, the show tries to make you believe that you can see the US Capitol from Dulles Airport (you can’t), that a woman will gladly flash her breasts to get a snooty flight desk clerk’s attention, and that TSA agents will only accost you for the decayed skull in your handcarried luggage — several minutes after you’ve arrived and come out the gates. All this, in an airport which was very clearly not Dulles, nor was it National, nor was it BWI. I decided to turn off the TV and just wait for something considerably less insulting to the viewer’s intelligence: House, which featured race issues and LL Cool J, with a bad heart and necrotic bowels. Brilliant. Thanks to DCist for the hat tip. You should’ve watched Gilmore Girls instead. House == AWESOME. It’s like CSI with a sense of humour and timing and generally being great.